Dear Tonny – Thank you for writing your extensive comment. Isn’t that a strange quality of human nature–that we can see so clearly the mistakes that have been made before, by ourselves or others, and still go marching merrily down the same path! We are very excited by the results we are getting from our deep-mulch methods in the gardens. (see http://alpinegarden.blogspot.com/2011/04/more-on-mulch.html ) In just two years, we have established a thriving earth-worm and micro-bugs eco-system such that we are doing almost no roto-tilling and adding only minimal organic fertilizers (almost NONE). We use mainly baled straw that has been spoiled by moisture so it is a waste-product for farmers. A great bonus for us (adding tons of organic matter each year), and keeps the farmers from polluting the air since they don’t have to burn the spoiled hay. 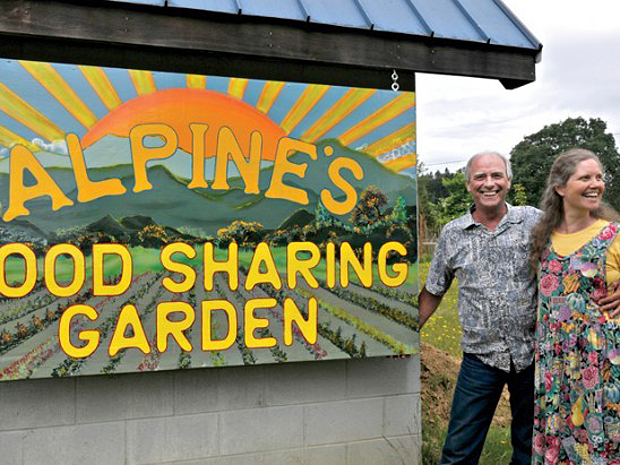 We wish you great success in implanting the ideas of the Sharing Gardens in your community. Send us an email at ShareInJoy-AT-gmail.com and we will add you to our blog-email list. Happy growing! so glad I came across this interview – I have been dreaming about this kind of garden and see that it really can work! thanks for sharing this and now it is easy to share this idea with others in my community by referring them to this interview!